Chances are your young children are dying to get their hands on it and play some of those eye catching games right? Here's a cool way to lock your Tablet in Kid Mode and keep your personal stuff safe knowing they're locked in a child friendly environment. Actually works as a replacement home screen for your Tablet, locking you in a very child rich and friendly environment filled with lots of videos from sesame street or other various shows with video interactive games. On top of all that they also offer stuff like art books and Arts books, and classic games like Angry Birds. You're able to make a profile for each of your kids, allowing them their own personal world they don't have to share with others if they don't want to. Because Zoodles Kid Mode locks you in this UI as a replacement launcher there's a special way you have to exit the Kid Mode World. The Zoodle Apps locks the Navigation bar so you'll rely on in app navigation arrows to get around, and to exit this app you'll have to back all the way to the main screen, access parent mode, and draw a "Z" to exit. This is nearly impossible for young children to figure out as it accesses all the boring areas they wouldn't really want to look anyways. What's best of all about Zoodles Kid Mode is it doesn't require any kinda Root permissions or special software or roms to work, and it's totally FREE, so anyone can use this. 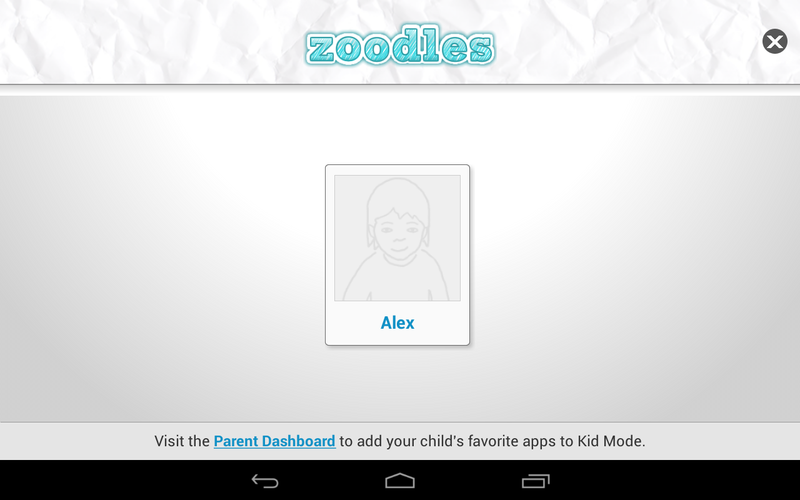 If you got a little one at home that likes to play with your tablet, I highly encourage you to try Zoodles Kid Mode. Keeps your kids in a friendly world, and your personal stuff safe from young fingers.